We have been a trusted, Licensed Florida Contractor since 2001. We are passionate about what we do because Florida is our home too. So rest assured, every project that we take-on is not just a job… it is a commitment! We have been a trusted, Licensed Florida Contractor since 2001. We are passionate about what we do because Florida is our home too. Therefore, every project that we take-on is not just a job, it is a commitment, and we are proud to have an extensive list of satisfied Residential & Commercial Clients to prove it! Our mission is to be Florida’s #1 Trusted Contractor of Choice. Every day we strive to provide our clients with Unrivaled Quality, Guaranteed Reliability, & Exceptional Customer Service. We want to serve your needs and we’ll do what it takes to ensure your peace of mind. 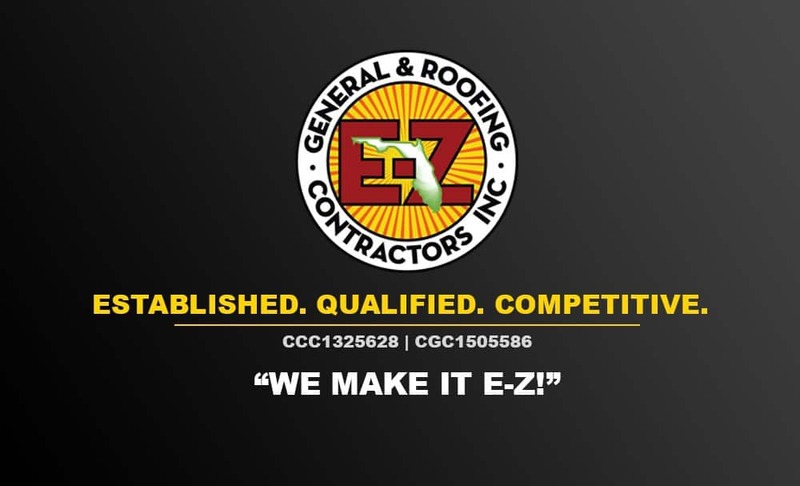 If you hire E-Z General & Roofing, we are confident that we will exceed your expectations every time! We are experts in storm restoration and we possess the necessary tools to thoroughly and accurately assess property damage. We’ll even work directly with your insurance carrier from start to finish… we’ll make it E-Z! Whether its after a major storm or just through the rainy season, a leaky roof can be rough. That’s why our EMS Team is hands-on and ready to help at a moments notice & when you need it most. So when the times get tough… let us make it E-Z! Ask about our Property Maintenance Program, a no hassle, preventative maintenance program that may help your forever home or life-long business actually last a life-time!